Chamomile (Chamaemelum nobile) is one of the most famous of the daisy (Compositae) family of plants. 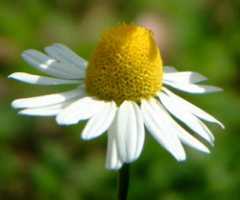 The essential oil of Chamomile is extracted from the leaves and flower cones by steam distillation and varies in colour from light green-blue to cobalt blue. The aroma of Chamomile is similar to that of a mixture of apples and newly cut grass. Chamomile is a creeping, low-growing perennial, with identical flower type. It is an aromatic glabrous annual, native to northwestern Europe and Northern Ireland, where it creeps close to the ground and grows to 60 cm, with erect stems, much branching and bearing 2-3 pinnate, gray-green leaves (Stuart, 1979, UMM). Leaves grow from the stems, and the flowers have yellow centers surrounded by white petals, like miniature daisies. It differs from German chamomile in that its leaves are thicker and it grows closer to the ground. The flowers smell like apples (UMM), and are approximately 2 cm wide, appearing early summer to mid-autumn (Stuart, 1979). Chamomile is one of the oldest favourites amongst garden herbs and its reputation as a medicinal plant shows little signs of abatement. The Egyptians reverenced it for its virtues, and from their belief in its power to cure ague, dedicated it to their gods. No plant was better known to the country folk of old, it having been grown for centuries in English gardens for its use as a common domestic medicine to such an extent that the old herbals agree that 'it is but lost time and labour to describe it' (Grieve, 1977). Long known as the ‘mother herb’, Chamomile has a history of use in all female problems and as a soothing tea for teething and colicky infants. It has also been used for indigestion and other digestive problems and as a sedative. Added to Massage and Bath Oil blends, Chamomile has pronounced sedative properties and is especially effective where there is nervous agitation associated with anger, irritability and over-sensitivity and can be found in the Wildcrafted Mellow Mood Massage Oil Blend , and Wildcrafted Relaxation Hydro Oil Blend . In skin care, Chamomile is renowned as a major analgesic, anti-inflammatory and wound healer, relieving pain, redness from any cause and promoting skin repair. It is good for dry, red, hot and sensitive skin and is said to have anti-allergic properties. In this respect, German Chamomile has a stronger action due to its higher Azulene content that also gives it the name of ‘super blue’. Like most essential oils Chamomile has antiseptic properties and so is used cosmetically as a skin decongestant and cleanser. Volatile oil, comprising azulene (chamazulene), farnesene, alpha-bisabolol, sesquiterpens, palustrine, quercetol, methoxycoumarin, furfural, apigenin, salicylic acid, choline, phytosterol, triacontane, fatty acids and flavonic heterosides (Stuart, 1979). Mossa, M. Howarth, R. Wilkinsona, L. and Wesnesa, K. (2006). Expectancy and the aroma of Roman chamomilenext term influence mood and cognition in healthy volunteers. 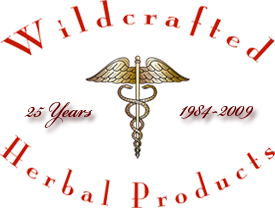 International Journal of Aromatherapy Volume 16, Issue 2. To assess the effect of the aroma of the essential oil of Roman previous chamomile (Chamaemelum nobile) and the impact of induced expectancy on mood and cognition in healthy adults, 80 volunteers participated in an independent groups design study. There were four conditions: (1) aroma and arousal expectancy, (2) aroma and sedation expectancy, (3) aroma and no expectancy, and (4) no aroma controls. Expectancy effects were induced by means of a pre-test session where participants were provided with false information from a supposed official source. Pre-test mood scales were completed followed by the Cognitive Drug Research (CDR) battery and a final post-test mood scale. Analysis revealed a significant effect of condition on overall quality of memory (p = 0.017), long-term memory (p = 0.008) and accuracy of attention (p = 0.024). Analysis of the pre to post-test changes in mood revealed significant changes in alertness (p = 0.002), and calmness (p = 0.00004). The sedative nature of the aroma appeared to combine with induced sedative expectancy to impair cognitive performance to a greater degree than was found for aroma alone. Subjective alertness was influenced by the sedative effect of the aroma which was ameliorated to some degree by the induced arousal expectancy. Similarly, subjective calmness appeared to be influenced by both the sedative effect of the aroma and induced arousal expectancy.